Pattern Roundup #3 - Sports Bras! Hello active people! It's time for the next instalment of the Pattern Roundup Series. We’re keeping it close to the chest today with BRAS! To be honest, when I started working on this post, I didn’t think I would find all that many bras – boy was I mistaken! There are lots more on the internet than you might expect, including a couple of freebies. Read on to find out more! Jalie Patterns: As usual, Jalie provides a number of sports bra/crop top options. Both #2563 and #3247 are combo patterns, with includes two crop top variations each. #2563 includes a thigh-length tight and #3247, a gym shorts pattern. There’s also Jalie’s #3679, the PIKA Sport Bra and Layered Tank which is available in my shop! You could make the bra by itself or use a fun contrast to create the blouse layer. Papercut Patterns: Papercut’s Pneuma Tank, featured in my ‘Active Tops’ roundup, is a bra-plus-top which can be made up separately or together – the crop-top bra has some fun elastic strapping details which are right on trend at the moment. Papercut Patterns are available in paper or PDF – or in my shop! Sewaholic: The Dunbar Top is another bra-and-top combo, with a fitted silhouette and a two-tone panel at the front – a great way to use up some scraps of mesh or contrast fabric. Available in paper or PDF. Bonus – Sewaholic also supplies translations of their pattern instructions in three non-English languages! The Dunbar Top is available as paper patterns from my shop. Greenstyle Creations: Greenstyle’s Endurance Bra is super-popular in activewear sewing circles, and for good reason. Excellent instructions and great drafting make this bra worth the effort. Perfect for a wide range of sizes, although A cups might want to look elsewhere. Unicose Patterns: Discovered while researching my Active Tops post, South American Unicose Patterns have literally dozens of designs for athletic wear. The main drawback here is that the site, and all instructions, are in Spanish! There are several interesting bra patterns available in sizes XXS to 4XL, for PDFs at around US$4 each! Measurements are in centimetres or metres, so you might want to have your unit converter app handy if you are used to imperial. While we're sewing in languages other than English, take a look at Ki-ba-doo's Sports Bustier ebook! Sizes 32-50 as a digital download, this sports crop has some interesting pattern details such as the v-insert at the front neckline and the elastic section in the upper back strap. Peek-A-Boo Patterns: Peek-A-Boo Patterns’ Vitality Racerback tank & sports bra pattern is available as a PDF download in sizes XXS to 3XL. I love that the fabric & notion requirements are handy on the pattern page here! Swim Style Patterns: Although Swim Style’s main focus is swimwear, they have several great-looking activewear patterns, including this crop-top-and-gym-shorts pattern. The Zeta Bikini would also make a cute sports bra for lighter support situations. Swim Style are an Australian company; patterns are available as PDF downloads in sizes XS-XXXL. Bra-Makers Supply: The Kerri ‘No-Bounce’ Sports Bra from Bra-Makers’ Pin Up Girls range (Sizes 32”-50” / 81-127cm) has plenty of bust shaping for a perfect fit, and can also be made up as a fitted top. The Alison Sports Bra (Sizes A-K) has a front zip and foam cups for added support. These are paper patterns and ship from Canada, but if you wanted to you could add ALL your bra-making supplies to your cart – these guys have everything you need. What a fun package that would be to find in your mailbox! Images from Bra Makers Supply. Check out this blog post to hack the Kerri with a front zip and some alternative seamlines – plus some excellent bra-sewing tips. 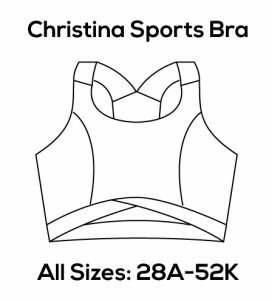 The Christina Sports Bra from Porcelynne has an excellent size range - 28A to 52K! It has great back coverage and comfortable wide straps. Available as a PDF download. The Julie Sports bra from My Golden Thimble is a classic racer-back crop-top in sizes XXXS-XXL, as a PDF download. Stitch Upon A Time: The Brazi Bra and Dress (sizes XXS-3XL) is a PDF download with that handy paper-saving layer feature! The crossover back is a cool feature, and there is also an add-on pack for a wrap front which could make a nice yoga bra. The pattern instructions also include extra cut lines and tips for fitting larger breasts. UPDATE: Stitch Upon A Time also offers the Calista Curvy sports bra which has some really cute strapping at the back, and curved seamlines at the front - check it out! The Resolution Bra and Tank pattern from 5outof4 Patterns is a racer-back bra, and the pattern includes a tank top too. I recommend reading her blog post about supportive fabric and techniques for sewing sports bras. The X-Factor Tankini looks like a swim top but would easily make a great sports crop in the right fabric. The OverUnder Racer Sports Bra and Tank from has a fun double layer back which would provide some excellent support. PDF Download, sizes XXS-3XL. SoSewEasy has a free downloadable PDF pattern (via Craftsy) and an info-filled tutorial (and video) for a sports bra! With an interesting diagonal princess seam and greater coverage of the back than most racer-back styles, this would definitely be worth stitching up for your gym wardrobe. Available in sizes M-3XL. The Sewing Rabbit (aka MeSewCrazy) offers a free download too, albeit only in size 34-36C. Mood Fabrics’ Emilia Sports bra has some fun piping details and a front zip. Download free after signup to their mailing list; US sizes 2 – 30. Sewing for Pleasure has a free simple racerback sports bra for sizes 34-35. Nicoleathome has an interesting hack for adding a heart-rate monitor keeper to your bra. KwikSew’s K3660 (below left) includes a front-lined sports crop with its tank top and yoga pants. K4181’s top has a shelf bra, and looks quite cute in the short length (below right). Another shelf bra in K3835; and a bikini top that could translate to activewear in K3239. K4113 is a princess-line top with yet another shelf bra lining. Simplicity’s ‘Athleisure’ category includes two bra patterns, S8339 and S8560 which are designed to coordinate with top pattern S8338. My inner cosplay geek was thrilled to find several of Simplicity’s costume patterns included some great-looking sports bra patterns. I’d be willing to try either of the Batgirl sports bras (and tights)! From Burdastyle’s Workoutwear collection comes the Sports Bra (01/2017). While it didn’t get rave reviews, (due mainly to lack of bust support), some pattern and construction tweaks could make it a more usable pattern. I also just found Sophie Hines who has a couple of cute bra patterns available for PDF download. I like what she's done with the Euler Bra Mod, but the Cartesian Crop really caught my eye with it's unique halter-style shape. Sizes XXS-XXL. She also has a free 'Lingerie Stitch Guide' PDF download - a very handy little resource! For an at-a-glance visual of all the above mentioned patterns – and heaps more – check out my Pinterest board! Know of any great sports bra patterns I haven’t mentioned here? Comment below so I can add them to the roundup!